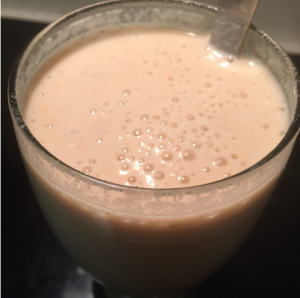 Excellent chocolate milkshake: 1 cup chocolate almond milk; one cup vanilla almond milk; One or two frozen bananas; 2 cups coleslaw salad mix with cabbage and carrots; one spoonful defatted peanut flour. Blend. 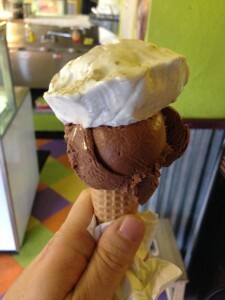 The cabbage mix adds thickness but the taste is all chocolate banana peanut. Here’s my dinner recipe to pair it with: Cook red potatoes; or, gold potatoes. Smash them. Cover them with black beans, salsa. Sprinkle sunflower seeds atop. The banana is a berry. It is mildly radioactive. It is often the subject of lowbrow humor. Consuming banana may alter dopamine levels. In Thailand they are said to be haunted. Folklore in the United Kingdom is told that blackberries should not be picked after Old Michaelmas Day (11 October) as the devil (or a Púca) has made them unfit to eat, by stepping, spitting, or fouling on them. There is some value behind this legend as wetter and cooler weather often allows the fruit to become infected by various molds such as Botryotinia which give the fruit an unpleasant look and may be toxic. The bathroom at the ice cream store features fine art on black velvet. I joined the Vegetarians of Washington and was handed a folder full of coupons. One was for Seattle Salads. Seattle Salads is a small place that serves Salad and Soup. Both the Salad and Soup were good. 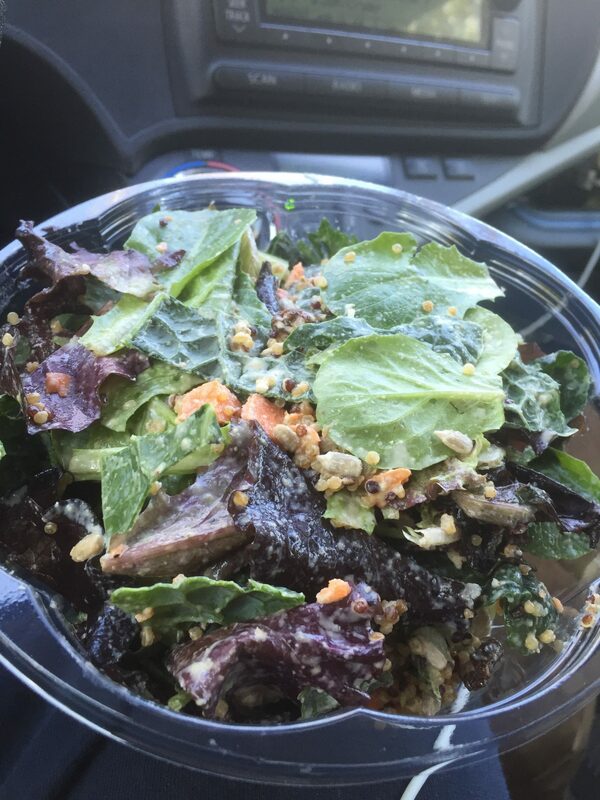 I had the Kale Lemon Tahini salad. It had carrots, avocado, and more in it. 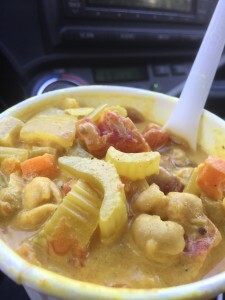 I also had the Curry Coconut Garbanzo soup with quinoa. 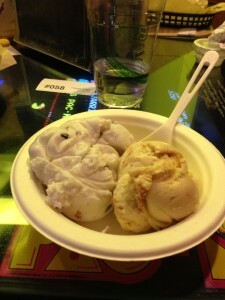 Later in the day I used a coupon for Full Tilt Ice Cream, which has non-dairy ice cream made from coconut milk. Everytime I hear “Pease Porridge Hot” I think, “What a terrible advertising jingle.” But then I note that I become desirous for pease porridge of any sort, and I further marvel at the longevity of the ad jingle; as well as the porridge itself. I also note that its popularity is possibly spurred by the fact that it long ago fell into the public domain. Now anyone can sing about pease porridge. Or make it in any combination of consistency or temperature. This takes the chill off even the coldest of pease porridge. I saw a man with a giant afro. At a distance it looked like a giant cowboy hat. It is impossible to express the joy of this sighting. Blame psychogenic alexithymia, if you must. A sign at a rest stop stating “You cannot be forced into work” translated into many languages. 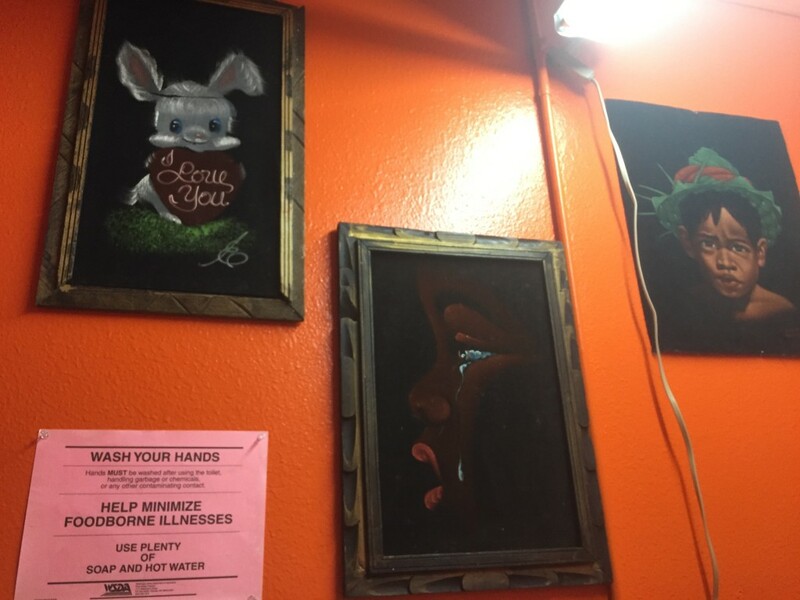 Whoever hangs these posters are unfamiliar with the peculiarities of capitalism in society. Also they hang these signs over the sinks, showing they are unaware that 90% of men do not wash up in the bathroom. And that is another reason to avoid shaking hands. Or perhaps they do know these things. I enjoy a good conspiracy theory. 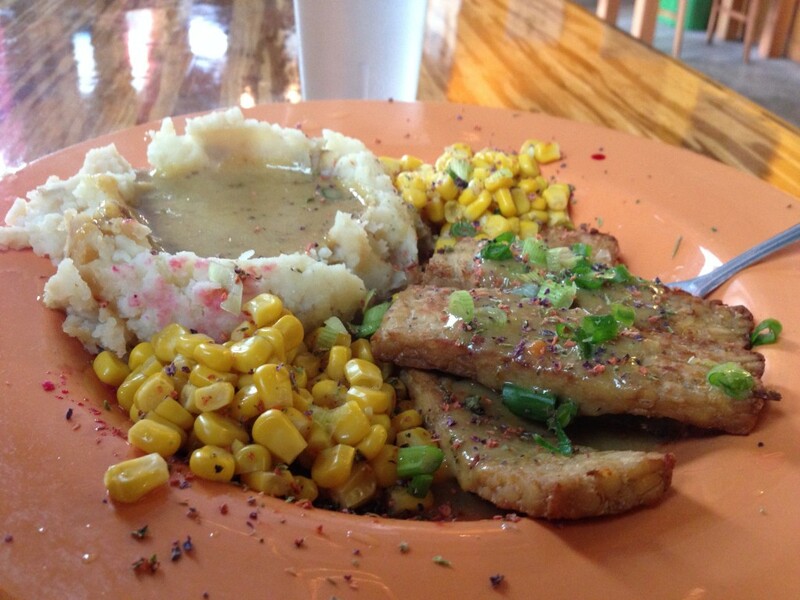 Tempeh, corn, mashed potato with mushroom gravy. Papa G’s Portland, OR. 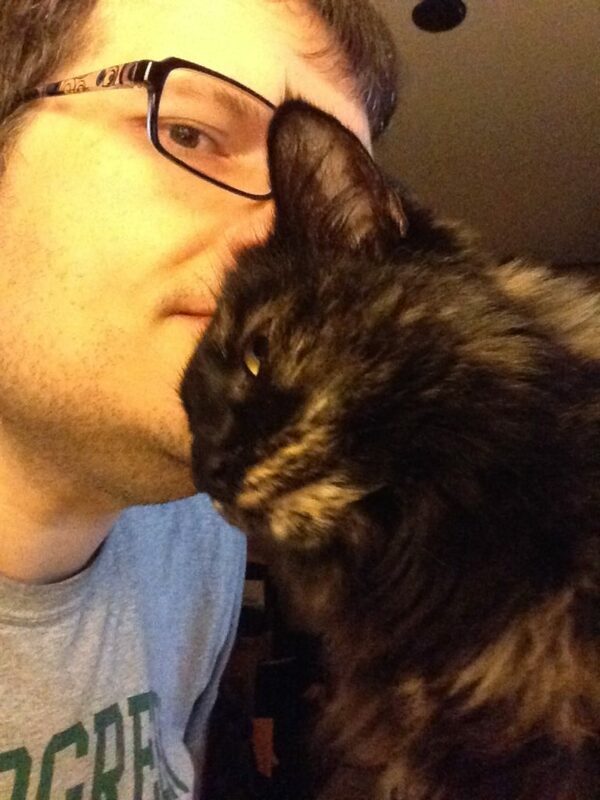 A cat tried to steal my love. Boil water and pour it in your wide mouth thermos, let it sit. This is to sterilize the thermos. Also pour boiling water over the lid. Pour the amount of soy milk necessary to fill your thermos into the sauce pan. In my case this is about 2 cups. Heat the soy milk, stirring occasionally, until it reaches a temperature of 160 to 180, but not exceeding 180 (Do not boil). Turn the stove off and remove the pot from that burner. When the soy milk reaches a temperature of between 120 and 115, but not exceeding or falling below that, stir in a spoonful of sugar (to feed the yogurt culture) followed by about 2 tablespoons or two heaping spoonfuls of the store-bought yogurt (this is correct for adding to 2 cups soy milk). Stir it well. Pour the water out of the waiting thermos and pour your yogurt mixture into the thermos. Place the lid on the thermos and set it aside for 10 to 12 hours. Do not move or shake the yogurt during this incubation period. After this time has passed open the thermos, stir, and pour into a container to place in the refrigerator. In subsequent yogurt making you may use your own yogurt as your starter. I have done this for about six generations with each batch turning out fine. The soy yogurt should have a good consistency but be a little runnier than most brands purchased in a store. If you attempt to use nut or rice milk the culture will take but it will likely stay very liquid. My first attempt at yogurt making was with almond milk and the result was a yogurt tasting almond milk. However this was also before I started adding in a spoonful of sugar and using a wide mouth thermos to keep the temperature steady during incubation. I was interested in how to make a yogurt starter without having yogurt in the first place. I have not tried this but it is my understanding that you can make a yogurt starter using five chili pepper stems and a dried tamarind, Using this in place of the yogurt starter to make the first batch. There may be monsters in the lake/their image is placed upon a cake/people come from far and wide/their belief in monsters they can’t decide/what they know, they know, yes, in haste/they all agree they enjoy the monster’s taste/its fearsome visage in red and green/I do believe it’s faux buttercream. Some find it appalling/coconuts are falling/the moment one rises from bed/but that’s just how coconuts get ahead. 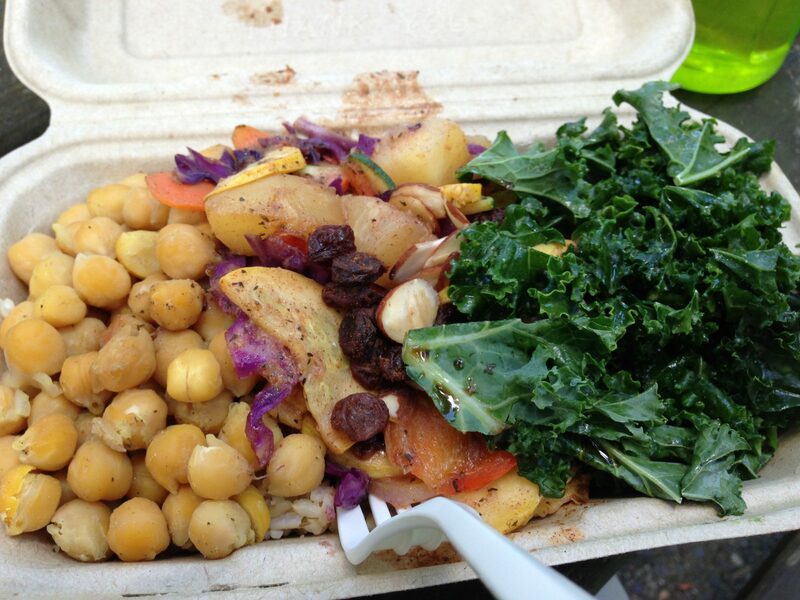 While I was sitting near the John Reed Bench in Portland, OR, I ate a meal I carried there from Sonny Bowl. You know, while I fomented revolution. Located at SW 3rd Ave & SW Washington St, Downtown, Sonny Bowl is one of Portland’s now ubiquitous parking lot food carts. 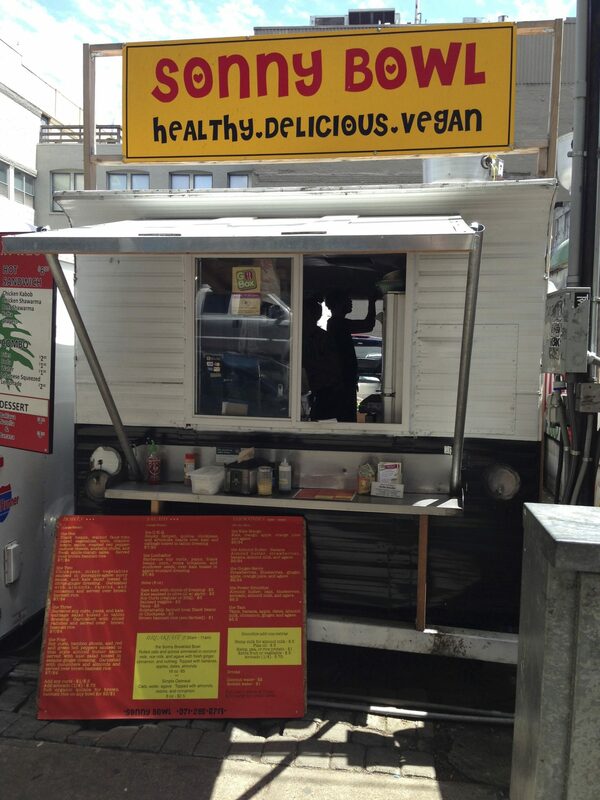 But it is an all vegan food cart. The full menu is available here. It was the best meal at a Portland food cart I have so far eaten. And I have eaten, I don’t know… at least 6 previous Portland food cart meals. Because I only eat at Portland food carts when in Portland. Because that’s where the food carts are.